Randy Wants For You To See This. 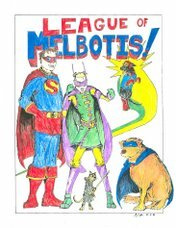 Tomorrow sees the release of the relaunch of Adventure Comics. For decades, Adventure Comics was up there with Action, Superman, Detective and other National/ DC Comics. It carried a lot of stories, but became well known for the Super-Family and Legion stories. Somewhere along the line they ended Adventure Comics, and added the Super Family title and gave Legion its own title. After several Legion relaunches in the past few years, I am hoping this stabilizes the futuristic "Legion of Super-Heroes", which is contained as a back-up feature. The main feature will contain stories of the modern Superboy, Conner Kent. 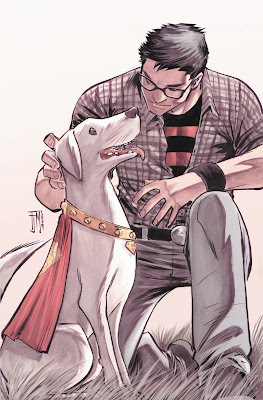 And Krypto, the Superdog. And for that, I am very glad. Add to it, the writing of Geoff Johns and art of Francis Manapul, and this series has as much potential as any new series from DC in years. Just, you know, with two dogs. Here's some more Superman stuff, too. We adore Lucy. She is a sweet and loving dog, and she tries very hard, but we've always known that maybe she wasn't going to be getting into dog-Harvard. But Scout just decided this evening to know how to fetch. Just sort of watched Lucy and decided "well, I can do that". She is learning her name. She knows where we're trying to guide her. She's cluing into the hints of dwelling with the family. And, knock on wood, she really seems potty-trained. She just stood at the door and waited for me a few minutes ago after sniffling at my hand for attention. I know that in a week or two, she and Lucy will not be growling at each other. And we'll be able to introduce her to Cassidy soon enough (I need to do some reading on best practices there). It might be a bit bumpy at first, but in the end it will be good to have Scout socialized so that she can tolerate being around other dogs, and having Lucy around will be a good part of that process. Here's an observation from this morning. I left the two of them alone while showered, etc... and they're fine. I sort of think Scout is just not sure how to share us anymore than she knows how to share Mr. Bun. Last night was actually better than Monday night. Its a process. It's weird seeing Mon El in present day instead of in the future. Mon El should be with the Legion. Seeing as I don't even read Superman titles, is Mon El still even a Daxamite? Also, DC just needs to give the Legion title back to Keith Giffen. Yup, Mon-El is a Daxamite in current continuity. My guess is that they're using this storyline to establish why he becomes a Legionnaire by choice rather than default. There's another Daxamite in the GL Books right now (Sodam Yat), and he was just asked not to come to Earth to meet Mon-El by a time-lost Legionnaire I'd seen a few times before, but whose name always escapes me. I saw Green Lantern - First Flight today and called it good. I thought Jordan's voice acting was a bit wooden, but it just may be they didn't give him much of a character arc. Sinestro? Spot on.